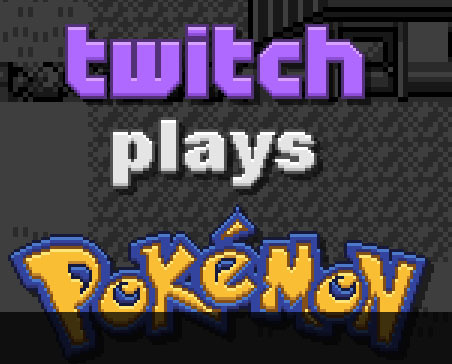 Let me clarify a bit, as you might be wondering what exactly Twitch Plays Pokemon is. At it’s start, Twitch Plays Pokemon was a simple program that a guy created which allows twitch viewers to input a command into the chat, which would translate into moving Trainer Red. For example, if I type the word “up” into the chat, then Red would theoretically move up one space. The goal was to see if a program like this would work at all, and also, he wanted to see if this was a fun experiment that people would enjoy. Would it be possible to get a bunch of people working together to actually get Trainer Red to his final goal? Well, the creator had a simple vision at first: see if the program works, see if people enjoy it, then refine the rough code so that a finished product can be put on Twitch for prime enjoyment. He never got that chance, however. 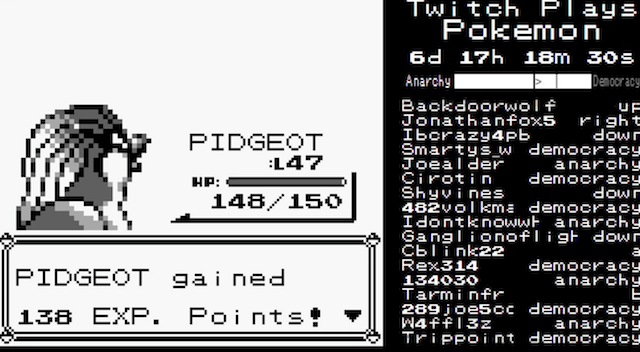 Viewers and players latched onto TPP faster than he had expected. Next thing you know, thousands of people are watching and playing at once. Then news outlets like Game Informer (that’s where I heard about it) reported on this quirky game after a couple days of uptime. Viewership exploded. At its peak, I saw TPP boasting 100,000 viewers! At that time, this one stream had more viewers than all the channels for the second and third most streamed games combined, which I think were LoL and Hearthstone. To think that so many people were watching a twenty year old black-and-white game. By this point, things had really become chaotic. The trolls had long since come into the daylight, and while the majority of players were striving to move Red forward, the trolls would constantly hit the START button, taking players into the menu until somebody hit B. Then, with so many people playing at once, the game started to lag, and it had to be put on a delay. So if you want to input a command, it won’t be used until about twenty or thirty seconds after you input it. By then, somebody else has already done what you’ve tried to do, so in essence, everyone is playing about half a minute behind the curve. Essentially, button input is random with a slight bias toward trying to move Red forward against the START trolls. So, changes needed to be made. At one point, the creator of TPP was considering putting the chat into subscriber only mode, since the community could not work together long enough to learn Cut. I watched that portion of the stream, and it was painful. They would get so close to teaching Cut, then when the game would ask “Are you sure you want to make room for Cut?” some troll would press B, and Cut would not be learned. Then, after about 3 hours of trying, I think they finally learned Cut and chopped down the desired tree. In the end, subscriber mode was not needed. But, eventually, the game became more difficult. Whereas navigating to the first couple of gyms is easy enough, it’s a lot harder to move through a dark cave (especially if you can’t work together to teach Flash and use it), navigate one-block-wide spaces between ledges, and cross oceans. There had to be a system where inputting commands was easier. I remember watching a segment where they had to move between ledges. Red needed to move a few dozen spaces to the left where there was an opening in the ledge; he could walk up and into the next segment of his journey. But, along that long westward walk, all it took was one troll pressing DOWN to make Red jump off a ledge, and be forced to walk all the way back to the right, enter the path at the beginning, then try walking far left to the next opening again. Absolutely painful. Enter the Democracy Vs. Anarchy System! A new system was put in place where participants could choose between Democracy mode and Anarchy mode. In anarchy mode, it’s total chaos; any inputted command will be used. In Democracy mode, as the name would imply, only the most popular inputs will be used. Therefore, if 60% of participants input LEFT, for example, then Red will more left, and the trolls wanting him to go downward are all out of luck. On the other hand, the trolls could potentially work together and all vote to go downward, thus making Democracy mode useless if they have enough drive and determination. In order to activate one mode over the other, the words “Anarchy” and “Democracy” must be typed into the chat. TPP will count the number of times each word is used, and it displays the results in a little slider above the chat with two bars; a black bar that shows the ratio of Democracy voters vs. Anarchy voters, and a white bar that shows how many votes must be obtained to move into the mode the group is leaning toward. To switch modes, a vote of 75% for the desired mode must be obtained. So, for example, if the black bar is at 55% toward Democracy, then the white bar will be sitting at 75% toward Democracy, and the game will stay in Anarchy mode until 75% of votes read Democracy. Then, when Democracy mode is obtained, the white bar shifts to the other side, sitting at 75% for Anarchy, showing that the game mode will not switch to Anarchy until 75% of votes are for Anarchy mode. Pretty complicated stuff for a game of Pokemon, wouldn’t you say? So, there you have it; that’s what Twitch Plays Pokemon is, as far as the factual stuff in the simplest terms. Right now, I think the TPP community has all 8 badges, and they’re heading for the Elite Four. It’s amazing to watch this all come together, and Part 2 of this article will focus more on the pop culture impact, the lore and mythical religion I referred to earlier, and so on. Thanks for reading, and I hope you enjoyed! If you would be so kind, please leave a like, a follow, or even both! Maybe check out the LP channels in my “Links” tab, and I’ll see you later.